The first sod has been officially ‘turned’ on a $5 million project to extend Warwick’s recycled water pipeline network to the industrial estates off McEvoy and Kenilworth Streets, but no businesses have signed up for access to date. 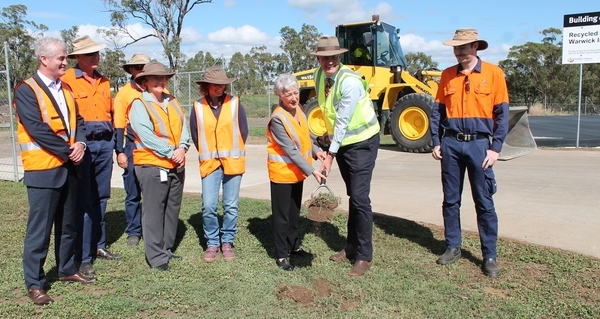 Queensland Local Government Minister Stirling Hinchliffe visited Warwick last Friday 12 April and along with Southern Downs Mayor Tracy Dobie performed a sod-turning ceremony at the Warwick Wastewater Treatment Plant. Recycled water from the plant is currently supplied to the Warwick Golf Club, sports grounds in Queens Park, Warwick State High School and Leslie Park from a storage reservoir at Barnes Park in Glennie Heights. The water is currently treated to ‘Class A’ standard which means it can safely come into skin contact with humans but cannot be used for drinking or for any commercial operation involving food production, with such water required by national regulations to be treated to ‘Class A+’ standard. The $5 million pipeline extension is jointly funded 50-50 by the council and the Queensland Government, with the Federal Government having allocated separate funding of $790,000 for a further extension at an unspecified future time beyond the industrial estates, to locations Maranoa MP David Littleproud has said could include “intensive poultry/egg production in the Warwick area”, without identifying specific businesses. But a council spokeswoman last week said the $790,000 in federal funding “is to further extend recycled water beyond the Saleyards to the back of Big W and close to Williams Eggs to extend the network even further”. Mr Hinchliffe and Cr Dobie spoke at length during the minister’s visit last Friday about the benefits the next stage of the pipeline extension will bring to local businesses in Warwick’s industrial estates, and about how it will reduce pressure on treated drinking water supplies in Warwick, Allora and Yangan. But Cr Dobie conceded no formal agreements have yet been signed for its use, with charging to be at lower levels than what the council charges residents and businesses for town water. What is known at this point is that the pipeline extension will include the truck wash at the Warwick Saleyards – currently closed due to the region’s extreme water restrictions – which at present uses treated town drinking water. At last week’s sod-turning Cr Dobie told the Free Times there was no current plan by the council to upgrade its recycled water to ‘Class A+’ but that food production and related businesses – such as Grove Juice and Integria Healthcare – could install the necessary equipment to treat the water to that standard at their own expense. The amount of recycled water produced by the Warwick Wastewater Treatment Plant (WWTP) at the end of Wentworth Street is directly related to the volume of wastewater – both greywater and sewage – produced by local households and businesses in any given week, and with the water restrictions currently in place recycled water coming from the WWTP is at a lower than average level. The WWTP also releases untreated ‘Class C’ water to Lyndhurst Stud directly across the Condamine River under a free arrangement which has been in place for some decades, although the council says Lyndhurst Stud is not currently receiving any water from the plant. As reported in the Free Times last year the council has been in negotiations with Lyndhurst Stud in recent times with the aim of charging the stud for the water it receives. Those negotiations are understood to be on hold due to the drought. The council has previously said it will review its current emergency water measures and investigations – including high-volume commercial water use and the potential use of bore water in urban areas – in the first week of May.